I know picking a camera that offers an all-around better vlogging experience, besides being affordable is an uphill battle. I’ve gone through it myself! Did you take a look at Canon EOS 70D? Disclosure: This post may contain affiliate links. Here's what that means? Canon EOS 70D comes in at around $1500+ (depending on the kit), though you may be able to find more options for lower prices if you shop around online. This camera is a vast upgrade from the 60D, combining the best features of that body, the T5i, 6D, and 7D, with superior movie motion tracking. A really great thing about the Canon 70D is the live view auto-focus system. This itself can make a huge difference. Besides that, it offers a lot more control, and you can buy interchangeable lenses for indoor, outdoor, nighttime, long-distance, and other shooting conditions. So, if you’re looking for very good video quality for your YouTube channel and vlogs, this is the one, you can go for without a second thought. To see all the Canon EOS 70D features, you can get more information here. Here’s a cool list, that’ll help videography enthusiasts (like you) choose the best camera for vlogging within your budget. Below is the list of the best cameras for youtube based on the recommendation of some top-notch YouTubers and my research as a passionate photographer. Believe me, these cameras are so cool that you’ll feel like trying your hands on creating awesome videos even if you’re a newbie. 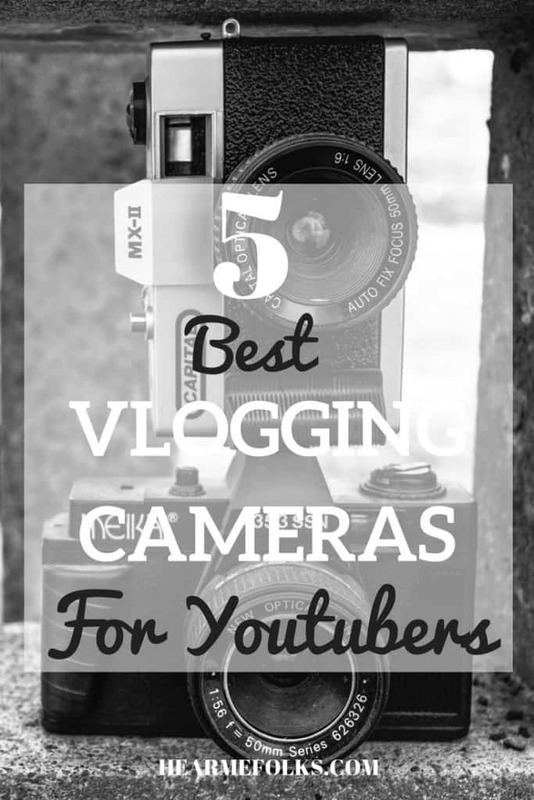 is one of the best vlogging Canon cameras happily endorsed by many famous Youtubers. This is also the best vlogging camera with a flip screen. G7 X Mark II is a well-designed camera that captures high-resolution images and stunning 1080p Full HD video in MP4 format with stereo sound and fast burst shooting (up to 8 fps). The camera has a comfortable grip that keeps the otherwise slippery body from sliding out of your hand. The camera comes with a built-in Wi-Fi and NFC capability which allows for easy sharing and transferring of images and videos. The in-camera RAW conversion makes it possible to preview modified images on the camera, without the use of a computer. With a useful 24-100mm equivalent focal range and F1.8-2.8 maximum aperture, the built-in lens is well-suited for low light photography. Its flip screen with tilting touchscreen technology makes it ideal for selfies and also for taking pictures at high and low angles with ease. It has an in-lens stabilization that makes the shots smoother..which is good. You can shoot time lapses, slow motions, vlog so technically this can be an all-rounder vlogging camera.The pretty good thing about it is the amazing audio quality, but since the speakers lie on the top if you mistakingly place your fingers on the top, it might mute your video.Night shooting is great, and it’s very easy to do timelapses and get quality images of the night sky. The major missing feature is you can’t plug in an external mic, so if you want directional sound you need to use this with the GH4. It doesn’t have an interchangeable lens. The lens is a fixed 24-100mm. Canon G7 X is the earlier version of Canon PowerShot G7 X Mark II that comes with the same features like flip screen, build in wifi, self-portraits and also fast burst shooting good for vlogging. The primal way they both differ is, the later one (G7 X Mark II) can shoot in 24P (frame rate) and is 100$ pricier than the earlier version. Mark II is more compact and also comes with a perfect grip. In addition, this camera can be charged via cable, as opposed to having to charge via the charger. If you forget to pack the charger on vacation, and you have the cable, you’re good to go. It has a better battery management than the original G7 X (265 shots against 210), but most of its peers can take a lot more shots per charge. If you’re looking for a cheaper version that comes with all the above robust features of G7 X Mark II than Canon G7 X is the one that suffices all your vlogging requirements. EOS M3 is a stylish looking wonderfully lightweight (but slightly more than G7 X) and compact camera. If you’re looking for a portable camera that performs similarly to SLRs then this is the best choice. It comes with a 24.2 Megapixel CMOS sensor that captures photos and videos with stunning detail even in challenging lighting situations. The touch screen 3.0 tilt-type (180° up/45° down) LCD monitor is perfect for selfies. You can easily transfer images and videos to a compatible smartphone or tablet with built-in Wi-Fi and NFC capability and share on social networking sites or view on an HDTV. You can create Full HD movies in MP4 format. The M3 offers the build quality, controls and customizability of its more expensive peers, yet is priced closer to entry-level models. Unfortunately, the M3 falls short in really important areas: autofocus, image quality, and battery life. This camera does just what a good mirrorless for vlogging should do. It has everything you will want as a vlogger to have a good experience recording videos for a good price: flip screen, good image quality, external microphone port, built-in WiFi, and Touchscreen. It can be appealing to any vlogger who appreciates a portable, mirrorless body with all the benefits of the best vlogging camera at an affordable price. Nikon COOLPIX A900 is a versatile camera that takes beautiful 20-megapixel photos and 4K Ultra High Definition (UHD) videos- even in low light. Its creative mode makes it easy to create artistic photos and videos, right inside the camera. It is ultra-portable and comes with super-telephoto NIKKOR glass lens that has the most zoom power of any COOLPIX Slim Zoom camera 35x optical zoom and a whopping 70x Dynamic Fine Zoom, that helps you capture distant subjects in staggering detail with brilliant image quality in nearly any light. The camera has a built-in Wi-Fi, NFC and Bluetooth low energy (BLE) that maintain a constant connection between the app and your camera, so each shot you take automatically transfers to your smartphone or tablet for sharing, editing with photo apps or uploading to your favorite sites. The camera has a built-in Wi-Fi, NFC and Bluetooth low energy (BLE) that maintain a constant connection between the app and your camera, so each shot you take automatically transfers to your smartphone or tablet for sharing, editing with photo apps or uploading to your favorite sites. Similar to Canon, Nikon also comes with a tilting LCD 3.0-inch screen that makes it easy to compose your shots and monitor your video recording. You can also use it to find exciting new shooting angles. Nikon COOLPIX A900 reviews aren’t quite as good as the earlier ones, but it’s several hundred dollars cheaper, which is a reasonable tradeoff for all of its benefits. If you’re looking for the best vlogging camera under 400$ with a flip camera then you can go for A900. As a hobby vlogger, I tried Nikon COOLPIX A900. I must say, this Nikon vlog camera is worth the money I spent. ELPH 330 HS proves this. ELPH 330 HS is yet another well-known vlogging camera for YouTubers. It is an excellent budget camera (rather cheap) that records 1080p Full HD videos in stereo sound perfect for start-up youtubers. It’s highly popular among the vloggers for being super compact and sleek than the Canon G7 X. The 12.1MP Digital Camera delivers sharply detailed images with vivid, natural color, even in dark lighting. The camera also comes with an Optical Image Stabilizer that corrects the unwanted camera movement caused due to handheld shooting. It has a built-in Wi-Fi that enables you to comment on photos and share them to social networking sites quickly and easily – even within specific groups. In simple, ELPH 330 HS gives the complete HD experience for a cheaper price and is a compact camera that fits in your pocket. If you’re a start-up vlogger then this is really all you need to start out. ELPH 330 HS will do justice. it proved itself as the best vlogging camera for YouTubers on a budget. It’s good for vlogging/because it achieves just what you need and it’s easy to carry around. I would like to conclude by saying that, your choice of camera totally depends on your goals for vlogging and the budget you allocate. Let’s get going! Do let us know which of these cameras, do you consider as the best vlogging camera and why? Did you find my tips useful?